For most people, their vehicle is more than just a transportation device. Do you know that with an OBD2 scanner, you can get to know your car better than ever? While they may not be living, breathing objects, you may find often enough that you still form a bond with your car. Some people may give it a name, some might find a form of solitude or peace in the driver seat, others may release tension in traffic by bursting out in song. Whatever you may or may not do in your personal vehicle is unique, but universally we hope every time we turn over the ignition, we get to where we are going safely and securely. One way you can get to know your car on a more personal level is with a car scan tool or nowadays it an OBD2 diagnostic scanner. 1 What is an OBD Scanner? 1.1 What Is OBD, OBD1, OBD2? 1.2 OBD scanner Operation: How does it work? 1.4 Why Get An OBD2 Scanner? 2.1 What Types of OBD Scanner Do I Need? 2.2 What Vehicles Are They Compatible With? 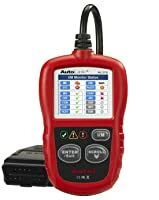 2.4 Do I Need an OBD2 Scanner with Advanced Functions? 4.2 What to do when your OBD2 scanner does not work? Since 1988, the technology beyond the dashboard has been programmed to maintain the most important vehicle systems with the introduction of On-Board Diagnostics, otherwise known as OBD2. Now, this is a standardized system on all cars and trucks. The design of the OBD2 system assists your vehicle by performing periodic tests of key vehicle components and emission monitoring. Essentially, it’s a vehicles’ self-diagnosing tool that regulates and monitors the health of your vehicle. In order to get behind the brain of the computer on wheels, technicians use an OBD2 car scan tool to read and analyze the data that your car gathers every day. What Is OBD, OBD1, OBD2? OBD, shortened for onboard diagnostics, is a diagnostic system designed specifically for cars. It monitors your car’s engine with the help of sensors. These sensors can detect abnormalities including issues with spark plugs, catalytic converter, etc. An OBD system can also communicate with you to update you on your car’s condition. While the first OBD system has been a massive success, there is now a better version in the form of OBD1, which was introduced in 1991. Launched first by California to curb vehicle emission, this system can report codes and also detect problems with the engine. Despite OBD1 being reliable, it did have some issues mainly due to a lack of standardization across manufacturers. This is why OBD2 was introduced in 1996. Thus, OBD2 scanners standardized the system and can be used with a number of vehicles without any issues. However, they are both in use today. OBD2 scanners do not only provide more reliable codes and fixes but can also cover more problems as well. Plus, they can provide a real-time diagnosis for quick fixes. This is why they are so heavily in demand. This OBD scanner buying guide will mainly cover OBD2 scanners since they are the most in demand these days. OBD scanner Operation: How does it work? In a nutshell, an OBD Scan Tool can link up to the computer database inside your vehicle to diagnosis all systems. With an effective scan tool, you will have access to Reading and Erasing Engine Codes, Checking I/M Readiness, which includes emissions. 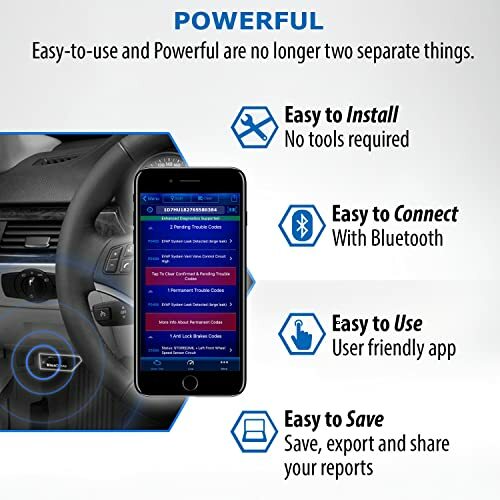 You also will have access to more advanced features such as online programming, key coding and other useful functions with an advanced automotive scan tool. I would suggest doing research on what scan tool is perfect for you and your vehicle, or check out a comparison chart of the top 10 best car scanners. First, check out how to correctly use an OBD2 scan tool. 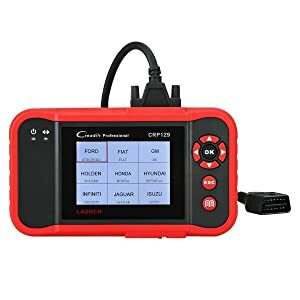 Each car scan tool is unique, however, the thing that remains consistent in all of them is the ability to help the user detect the diagnostic trouble codes stored within the vehicles On-Board Diagnostic system. These codes, better known as DTCs – Diagnostic Trouble Codes, identify the problem area and provide an inside look at where the problem may be occurring. Today, our vehicles are smarter and more advanced and often can self-correct an issue, however, some problems need extra assistance. If the check engine light or Malfunction indicator light turns on, that means the Power Control Module (PCM) cannot decode the error. Within your vehicle, a series of codes create a language to tell you what is occurring beyond the dashboard. This is when a car scan tool comes in handy. Using a car diagnostic tool, you can decode and discover the source of the problem. If your check engine light has come on, there are various reasons that could be causing it, with a multi-functional scan tool you can gain access to a series of functions to help make the diagnosis easy. A typical code reader can only help read and clear codes. But, a car scan tool grants access to live and stored data as well as enabling the user to perform many other functions. Some of the most common error codes come from the transmission. Whether that may be an overheating problem, transmission control malfunction or low transmission fluid, with an auto scanner that gives direct access to transmission codes, the diagnosis will be a piece of cake. The ABS system stores information about wheel speed, brake fluid, and antilock detection, which controls the most important thing about your vehicle: how to stop. The SRS system, or airbags, monitors wheel speed, brake pressure, and seat occupancy to ensure all passengers are secure in the event of an accident. These systems are key components that an OBD2 scanner can detect are running smoothly. Or TPMS is a system that’s primary job is to inform the driver about the state of the tire pressure within the wheels. With normal conditions, the OBD system will alert the driver when the PSI of a tire falls below 25%. Before changing the tires on a vehicle, its always recommended checking the TPMS with a scan tool. After you have checked the oil levels on your vehicle, and finished the proper maintenance, whether that be replacing the pump or sensor, sometimes the pesky oil light remains on. In this case, an OBD2 scanner is the best tool to reset the light and inform the OBD system that everything is working properly. Testing the battery is an important part of vehicle maintenance, in order to check battery health and to avoid the problem of the car not starting. Using an OBD2 auto scanner or battery tester, you will have a clear reading of when or if it is time to replace the battery. Not all scan tools are built the same, if you purchase a more advanced scanner or a bi-directional scan tool, you may have additional features that are not common in ALL products. Online Programming- If this is the case, you may be able to program and update your device through wireless or internet connectivity. This will keep your device up-to-date and give more accurate vehicle readings. ABS, Misfires, Battery Information- You can ensure your vehicle is in good health with a clear reading about the diagnostics of your vehicles ABS system, battery system and all engine misfires happening with live data streaming. Anti-Lock Brake System and Key-Coding- The most important systems on your vehicle can detect how fast your car is moving and how much pressure to give to your brakes in order to stop your vehicle from propelling forward. You can receive real-time accurate data about your vehicles brake speed with advanced functions from a scan tool. If you get really advanced, some newer scan tools allow you to program new keys for your car, which will help you avoid high costs form mechanics. CEL, RPM, Fuel, Speed, Pressure, Coolant Temp, Live Map: Many different parameters are measured when there is a misfire in the engine of a vehicle. With Freeze Frame technology, a scan tool is able to take a snapshot of important information such as RPM, Fuel, Speed, Coolant Temperatures and Live Map of the exact location a problem may be occurring. Air Fuel Ratio and O2 Sensors.- determining the condition of the oxygen sensor in your vehicle is vital to make sure everything is operating smoothly. If the Oxygen Sensor is malfunctioning, this may cause the engine to read problems slower or inaccurately. A scan-tool can read emissions of your vehicle and understand if all ratios are proper. Battery Performance, Engine Performance, Oil Temp: Most effective scan tools allow you to test the voltage, current, and continuity of the battery life on your vehicle. This will ensure your vehicle is running properly and you will ensure high engine performance. You may not be able to read the oil temperature with all scan tools, but if the error code arrives, you can quickly read the definition of oil temperature. Why Get An OBD2 Scanner? An OBD2 scanner will let you read check engine light codes and even provide a fix. That’s not all, they will also perform advanced functionalities like check battery performance, do smog tests, EPB, key coding etc. Hence, you’d be saving a lot of money by fixing small problems yourself and saving a trip to the garage. We prepared this review after testing several OBD2 scanners to find the best OBD2 scanner. Some were extremely good, some were extremely bad. We made sure to only include the best OBD2 scanners after comparing them on features, prices and other such factors. OBD scanners can help you save money, but you must pick one carefully. This OBD scanner buying guide is designed to help you in this regard. It will answer all your questions related to scanners while making it easy for you to pick the right scanner. What Types of OBD Scanner Do I Need? This largely depends on your vehicle and requirements. Ideally, you should go for OBD2 scanners since they are more powerful. However, OBD2 scanners do not support old cars (usually older than 1996 models), so that can be a problem. Pick a scanner that is compliant with your vehicle. The next step is to consider different types. They are explained below with the help of comparison charts. Main Functions Can check actuator and sensor for high resistance, shorts and opens. All values that are out of range are sent back to the ECM. Can do all that OBD1 scanners do with additional functions including smog tests, graphs, customization, record and playback data, etc. Give access to few PIDs and can also clear set engine light, but don’t offer troubleshooting, live data, graphs, and other such detailed features Do all that basic code readers do with access to all major PIDs. Plus, offer code definitions and information on basic troubleshooting. Can also handle bidirectional communication Do all that DIY scanners do with added features as some come with additional testing tools like multimeters and scopes. Plus, some may give access to additional PIDs. The right type of those troubleshooting scan tools depends on your needs. DIY scanners seem to be most popular since they offer a balance between basic and advanced tasks. If you are a car enthusiast or DIYer then you should go for DIY scanners. They are easy to use and are also compact in size. Plus, they also often come with guides and tutorials. However, if you are a professional or need very advanced features then opt for professional scanners. They are large in size but offer almost everything that a mechanic needs. You should pick the scanner that supports your vehicle which depends on the year it was manufactured in. 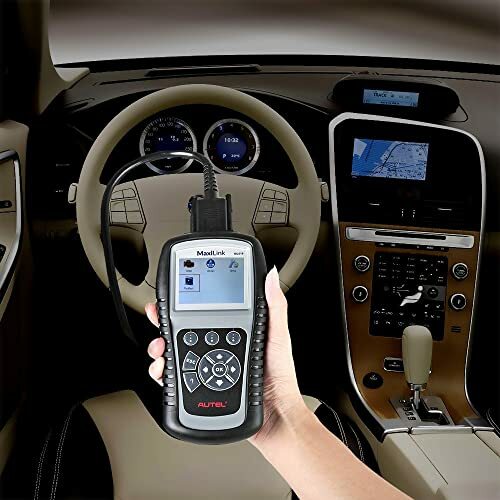 There are some 2in1 scanners as well that support both newer and older car models. They can be a good option if you have two or more cars from different eras. Just make sure to pick a scanner that offers all the functionalities that you need. What Vehicles Are They Compatible With? Support most cars manufactured between 1991-1996. Plus, few newer and older models might also be supported You may, however, need to purchase cables separately. Moreover, since they are not standardized, a scanner made for Ford will not work for Toyota. You will get different diagnostics even if both cars have similar issues. They support almost all models released after 1996. However, they might not work with hybrid and electric vehicles. OBD2 scanners can perform a mix of basic and advanced functionalities. However, what they can do largely depends on the manufacturer and app they support. Fuel Pressure, DPF Temp, Smog Testing, O2 Sensors and Fuel Trim. Other than this, most OBD2 scanners offer Graphs, Digital Display, Data Export, and Dashboard Customization as well. Plus, they can all suggest repairs but some may come with more reliable solutions than others. Key Coding, ECU coding, ECU programming, Online Programming, etc. Do I Need an OBD2 Scanner with Advanced Functions? Only you can answer this question. 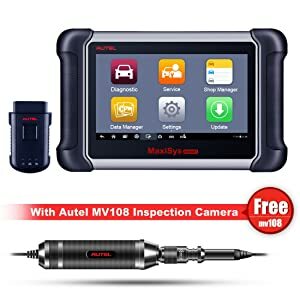 If you are not a tech geek or have no knowledge of codes and vehicle maintenance, then there is no point in going for a scanner with advanced features. You will not be able to understand most of the codes and will anyway have to take your vehicle to a mechanic. However, if you are a tech enthusiast or professional then you should go for advanced features. A scanner with advanced features will help you understand your car better. Plus, the right OBD2 scanner can even allow you to customize your vehicle and get more out of it. Corded scanners make use of a wire to connect with the vehicle. Most come with a wire that’s supported but you may have to buy separately in some cases and connect it with the port. This is the biggest drawback of corded scanners, yet many people still use them. Some also find them to be easier to use because there is no need to worry about Bluetooth or WiFi signals and devices being supported. However, wireless scanners seem to be more popular. They both do the same job: provide you with diagnostics but using different technologies. Bluetooth and WiFi scanners can connect with your Windows, Android or iOS device to transfer data. We prefer Bluetooth over WiFi since it consumes less power and is typically faster as well. However, you will not face much difference in terms of speed since OBD2 scanners only transfer small data. Apple’s MFi program prevents certain Bluetooth devices from working on iOS devices. This is why some Bluetooth scanners do not support iOS devices. In addition to this, WiFi adapters can be a pain when connecting to the internet, especially when used with Android devices. Since they do not serve as modems, you will have to disconnect the internet every time you have to search for a code. This can be avoided by using Bluetooth scanners. All in all, we would say it is a personal preference. Some people like wires and some do not. Overall, the features provided by a scanner depend more on the brand and less on it being wireless. Want to get the best OBD2 scanner and reduce trips to the mechanic? Then you’ve landed on the right page. OBD2 Scanners can diagnose and fix problems in your car’s engine. They display check engine light codes when there’s something wrong with the engine and some also suggest fixes. Some advanced OBD2 scanners also let you do much more than just fix CEL (check engine light) codes. They can handle ECU programming, IMMO, DPF, etc. You will need to get the best OBD2 scanner and you are good to go. 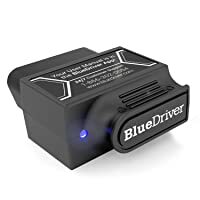 These are the cheapest OBD2 scanners and offer many basic functions such as checking engine light codes, reading and clearing DTCs, etc. You won’t find any advanced features on them and a very few of them can connect to a smartphone or third party app. So, wireless connectivity can be an issue here. These scanners mostly come with dedicated mobile apps to connect wirelessly. Most DIY scanners can make a connection with a smartphone. In terms of functionality, they are better than basic OBD2 scanners but are not suitable or professional use since they only offer a few advanced functions. These scanners offer solutions to complex car problems. You will find many advanced features in professional OBD2 scanners such as ECU coding, key programming, DPF, EPB etc. This is the best OBD2 scanner among all three. OBD2 compliant 1996 and newer US-based models. OBD2 supported 1996 US and newer models. Want to read more about the whole 10 Scan Tools in the list? Let’s dive into the details now and learn why these are the best OBD2 Scan Tools. 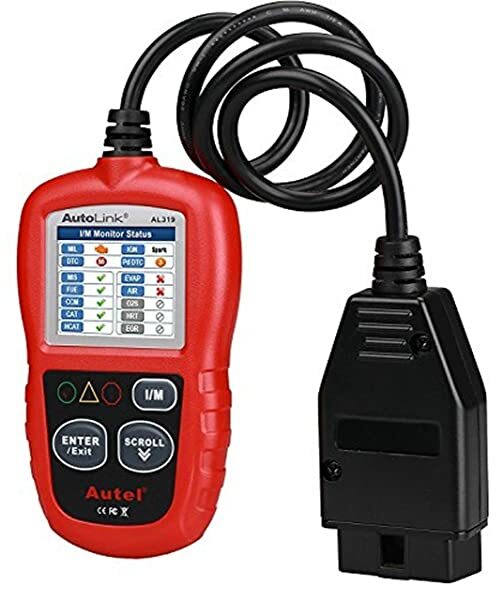 If you have a 1996 model or newer car then Autolink AL319 being a plug and play OBD2 code reader can be a good option. AL319 diagnoses and fixes problems quickly and is a good fit for beginners even if they don’t know anything about engine problems. AL319 will check engine light codes and clear them. It shows live PCM data so that you can know which parameter is wrong. Basic functions of Autel AutoLink AL319. Freeze frame data tells you the reason for your car’s breakdown. Other common functions it offers include I/M Readiness Status(emissions), Live Sensor Data, VIN, CIN, CVN, and DTC Lookup. With AL319, you can print the code along with the definition. This is a good option as you can show it to any professional and ask for tips – even a Google search can be of help. Autolink AL319 doesn’t support Bluetooth or WiFi as it is not phone supported. AL319 OBD2 code reader lets you download free updates. The only bad thing about the product is that it doesn’t support phone connectivity and the cord isn’t too long either. It has P0, P2, P3, U0 and U3 within the DTC library. Short cord – won’t allow the device to come to the lap. Doesn’t display VIN information on some models. It doesn’t read Volvo XC90 codes. Autolink AL319 for corded connection. DIYers and car owners who want to save money by taking their car to a mechanic. Car owners who can deal with a corded yet useful scanner. Not suitable for professionals due to a lack of advanced functionalities. 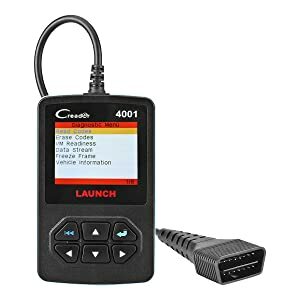 Launch Creader 4001 is one of the best obd2 code readers you can find in this price range. It offers basic functions, supports obd2/Can/European/Asian models manufactured in and after 1996. Launch Creader 4001 can read and erase DTCs, Display I/M Readiness Status, Live Data Stream, Freeze Frame Data, etc. Moreover, it can fix a Malfunction Indicator Light (MIL). The DTC lookup library lets you view the definition of the code displayed. 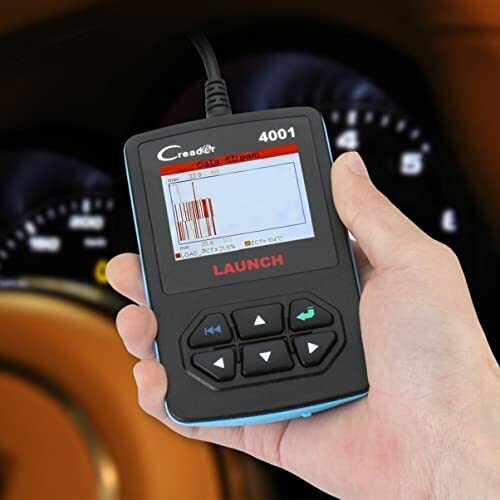 Launch Creader 4001 is one of the best obd2 code readers you can find in this price range. Launch Creader 4001 shows a well presented graphical data on the 2.4-inch color display and has a good ergonomic design. The downside of this OBD II scanner is that it is not phone supported and doesn’t support JOBD protocol (Japanese models, even if they’re OBD2 compliant). Launch Creader 4001 is compatible with all 1996 and newer models that are OBD2 compatible. Also works on 12v diesel vehicles. No phone support or updates available. Not available for cars that have a JOBD protocol. Creader 4001 is a simple OBD2 code reader which is built for car owners who want to fix small car problems. NT301 car scan tool is open to global customers. It is an upgraded version from the basic car obdii diagnostic scanner with distinctive features. No battery required, it is charged directly from the OBDII car scanner interface in your vehicle. 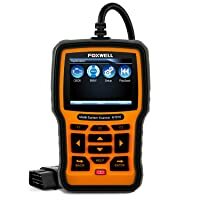 FOXWELL NT301 provides some amazing functions which is why it is one of the best OBD2 code readers we have on the list. It shows the code’s definition on the TFT screen which is graphically superior and also erases DTC (engine fault codes). Other than that, Foxwell NT301 performs most of the common functions such as CEL(check engine light), MIL(malfunction indicator lamp), VIN etc. Supports multiple code requests including manufacturer specific, generic and pending codes. Performs engine diagnostics such as Fuel Trim, Engine Coolant Temp, I/M Readiness, Freeze Frame, Fuel Pressure, RPM ECT and reads live O2 Sensor as well. NT301 doesn’t have any advanced functions such as DPF, Programming, and Key Coding. 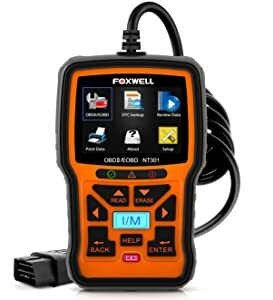 Foxwell NT301 features with most basic OBD2 functions. NT301 supports five major OBDII protocols. No phone connectivity. 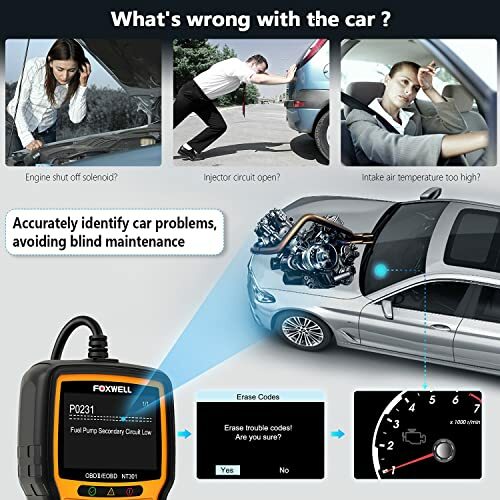 This OBD II scan tool is connected to the CPU of the vehicle using a diagnostics cable. Charges when the ignition is on. On-screen DTC definitions that point the exact problem. Can be updated through the internet. Saves data log that can also be printed. The scanner doesn’t support BMW. The appearance of white dots in place of text after some time. Only for car owners and DIYers because it doesn’t offer advanced options. 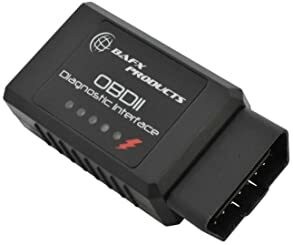 Many similar OBD2 tools CLAIM to work on all vehicles but have problems with the J1850 & CAN protocols however….. the BAFX Products OBD reader actually DOES work on all vehicles & ALL OBD2 protocols! BAFX is an OBD2 scanner that performs diagnostics on your vehicle’s engine and provides with instant results. Moreover, it is the among the most selling code readers on the market. Running a diagnostic while the vehicle is in motion can help driven can detect problems in real-time. These include engines issues, overheating issues, sensor problems etc. BAFX shows results in a graphical form which is easy to read. BAFX also lets you perform smog test to check for excess emissions in the car. This can check Coolant Temp, Oil Temp, CEL Fault Codes, Air Fuel Ratio, Fuel Pressure, DPF Temp, O2 Sensors, Fuel Trim, Emission Test, etc. The downside of BAFX is that it loses connectivity on some models. Moreover, it doesn’t have an app of its own. You will need to download a third party app to use it. This OBD2 scan tool can be operated via a smartphone. It supports Android and Windows phones only and is compatible with 1996 and newer models including hybrid cars. Works great in 20ft range. For DIYers and car owners for performing simple diagnostics. The above four were the best four OBD2 code readers. Now, let’s have a look at some of the best DIY OBD scanners. BlueDriver is an expert problem-solving Scanner, authorized for Apple and Android devices. In this device features of a sophisticated scanner are coupled with the marvelous technology in your smartphone, giving you a unique tool to count on. Bluedriver is the best OBD2 scanner for many reasons. The biggest one being it supports Bluetooth. It performs almost all the basic and some above-average functions as well. 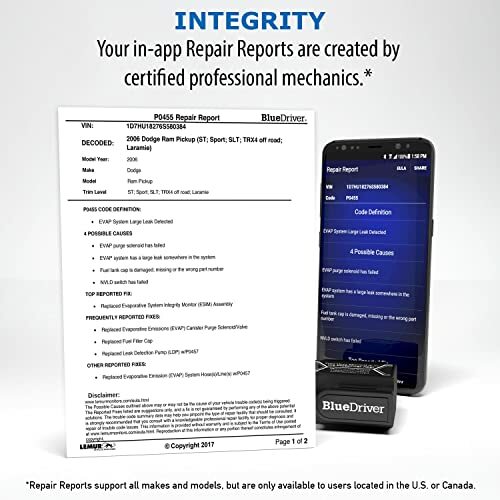 Bluedriver scanner has around 30 million fixes in the database that provides you with an accurate and complete repair solution. Bluedriver can conduct a variety of advanced tests such as Fuel System Test, Comprehensive Components Test, Airbag, ABS, Misfire Counts, etc. Bluedriver scanner offers great customization options. You can customize the type of data you want to see such as RPMs, speed, fuel pressure, etc. Bluedriver scanner shows accurate information regarding your vehicle’s maintenance schedules, TSBs (technical service bulletins) and specifications. Smog tests let you know if your car is producing excessive emission. BlueDriver is easy to use as a code reader with all the capabilities of an expensive handheld scan tool. A log file can be made and exported to a computer as well. The downside of Bluedriver is that it doesn’t support camshaft timing. Also, you can’t reprogram a FOB and read transmission temperature. Bluedriver scanner supports all Volkswagen, Chrysler, GM, BMW, Honda, Ford, and Nissan models sold in North America. The software runs on both iOS and Android devices and is also free to download. Offers all basic and a few advanced diagnostic features. Reads and clears CEL codes. 6 million verified fixes from the scanner. Vehicle owners who want to perform engine tests using their phone can turn to this best OBD2 scanner. It is smartphone operable and works on Bluetooth technology. It’s a good fit for DIYers. Autel Maxilink ML619 is an OBD2 scan tool that can detect faults on anti-lock brakes ABS, SRS, airbag systems, etc. It can also read generic and manufacturer specific codes. The scanner comes with a USB cable, 16GB micro SD card, and a nylon cover. Autel Maxilink ML619 offers some useful advanced functions including ABS Warning Lights, SRS Warning Lights. With Autel Maxilink ML619, you read and clear codes that are pending, check and clear CEL codes, and shows drive cycle readiness as well. You won’t be only seeing a trouble code on the screen but a full explanation. For example, if something’s wrong in the intake valve, it will show P1135 = ‘Intake Valve Timing Control Bank 2’. Autel Maxilink ML619 does tell you about the problems in the ABS and SRS systems but doesn’t stream live ABS sensor signals. Autel Maxilink ML619 is one of the best obd2 reader which is a corded device. Print data logs on PC. Can be used on multiple vehicles. Need to register on the website to update. Only for USA/Canada vehicles (gives range error in other models). 46 feet cord can be too short for some people. 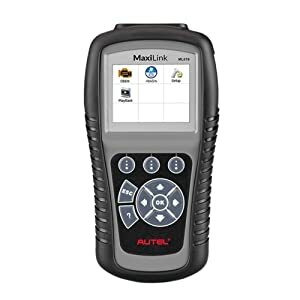 Since it can cover many basic functions and also show and clear ABS and SRS light issues, Autel Maxilink ML619 is an excellent option for DIYers if not the best OBD2 scanner and people who want to avoid garage trips. The all-new 3100j is the perfect entry-level tool designed to empower any consumer or technician when it comes to vehicle maintenance and repair. This code reader works on all 1996 and newer OBD2 cars, light trucks, SUV’s, hybrids, and minivans. 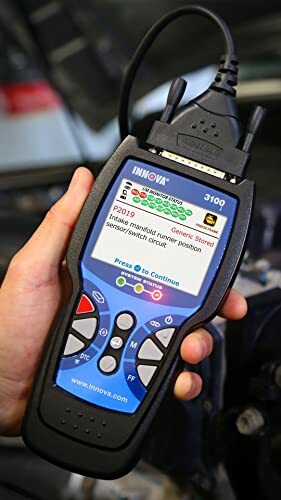 Innova 3100J is an OBD scanner that can display CEL messages along with their fixes. It will help you keep the car’s battery’s performance in check by doing battery tests. It also performs the oil reset test and provides step-by-step instructions on how to do it. Innova 3100j can read and erase CEL codes by providing with accurate information on which part of the engine has a problem. Innova 3100j analyses and provides information on the anti-locking braking system on the car, SRS system and airbag system. Innova provides you with detailed information when you get an oil reset light powered on. This will help you fix it. Also, you can perform an EVAP test to check for leaks. The downside of the Innova 3100j is that it does not work remotely. Works with all 1996 and newer OBD2 cars. Moreover, Innova 3100J also supports some light trucks, SUVs and hybrid models. Innova 3100j analyses and provides information on ABS, SRS system and airbag system. ABS and SRS warning codes. Comes with a USB cable to connect to a PC and download updates. Multiple language selection options including French, English and Spanish. Sometimes, the light won’t go off even after fixing oil, SRS and ABS issue. Updating the software requires you to connect the device to a computer. DIYers who want to take care of small fixes such as CEL light warnings can opt for this OBD scanner. It’s not for professionals. Also, don’t buy it if you’re fond of operating OBD scanner with a phone as this one doesn’t offer phone connectivity. 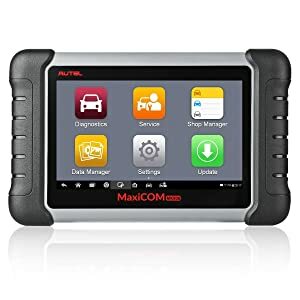 MK808 is one of the best OBD2 scanners on the market for vehicle geeks who know their way around with cars and can repair complex malfunctions, too. It’s a diagnostic tablet with a 7-inch LCD that makes the scanning process a lot of fun. It works on polymer battery which comes included. You can easily use it for 4.5 hours straight. Apart from offering conventional OBD2 functions, it has many advanced features in store for you to use. These include EPB, SAS, DPF, Oil reset, BMS, ABS, TPMS, and Key Programming. Only a Professional OBD2 scanner can offer these features. MK808 lets you save, manage and print diagnostic results. It has a memory of 32GB which is enough to save the information. MK808 lets you perform emission tests, ABS light test, SRS test, fuel system diagnosis, wiper system, light systems and all common OBD2 scanner functions. The downside is that you have to purchase for software updates after the first year. 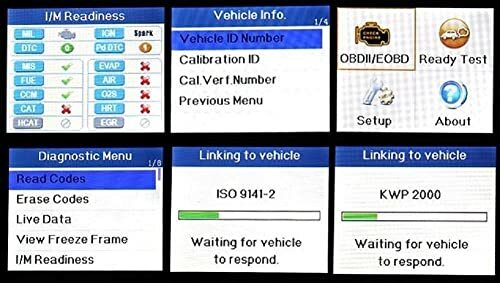 MK808 supports a variety of vehicles that are 1996 US-based and 2000 EU based OBD2 compliant such as Acura, Audi, AUFord, Bentley, Benz, BMW, Bugatti, Chevrolet, Chrysler, Efurd, Ford, GM, Holden, Honda, Hyundai, Infiniti, Isuzu, Jaguar, KIA, etc. It covers all major PIDs and works and has a built-in Android system 4.4.4. A9 processor processes queries really quickly. MK808 OBD2 scan tool is built for professionals who want to perform advanced functions like ABS, SRS, DPF, IMMO, TPMS, etc. Professional seeking the best professional diagnostic scanner that can perform advanced diagnostic functions should turn to CRP129. It diagnoses and shows results in an instant. The device has an interactive 3.5-inch display and is also internet enabled. With CRP129, you can diagnose four different systems including ABS, airbag, engine and transmission. 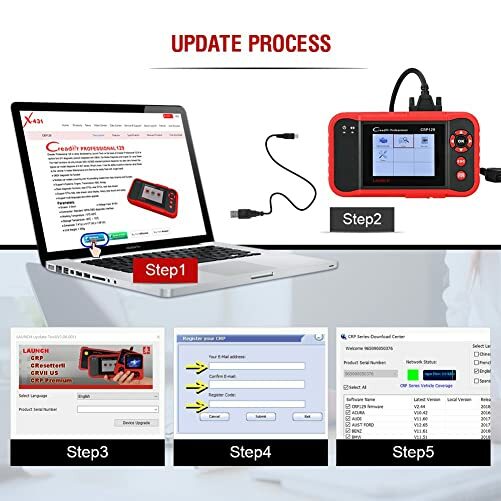 CRP129 is an OBD II scanner that can perform extensive diagnostic functions such as SRS, SAS, Transmission Test, Oil Reset, EPB Reset, and ABS Bleeding as well. CRP129 also performs basic functions such as CEL Codes, Read and Erase DTC codes, Oxygen Sensor Test, Carbon Canister Test, Read Live Data, etc. Provided with a manufacturer’s full one year warranty and access to all the latest online updates. If the sensors of the steering are replaced, CRP129 deletes the memories of previous sensors and replaces them with new. CRP129 supports over 40 1996 and newer US-based vehicles and 2000 and newer EU based vehicles that are OBD2 compliant. Doesn’t support BENZ and BMW (versions older than 2002). Professionals looking for the best automotive scanner that can perform advanced car diagnostics should go for this device. It is also a good fit for mechanics. Autel MaxiSYS MS906BT is a wireless scanner and operates on an Android system. MS906BT operates with a 6-core processor that processes tests quickly and shows results in a matter of seconds. 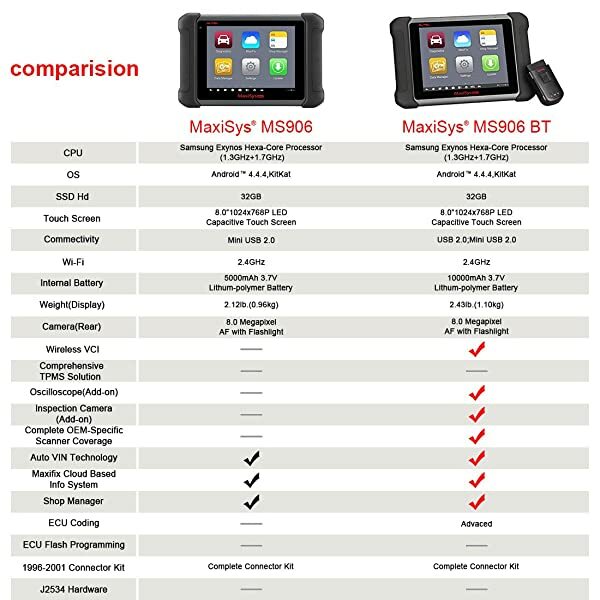 Comparision chart of MaxiSys MS906 and MaxiSys MS906 BT. Tablet scanners have low batteries. However, this one has a power packed battery of 10,000 mAh which can last for 14 hours. MS906BT can perform a variety of professional diagnostics such as SRS, ECU coding, TPMS, and EPB. There are HDMI and audio ports at the back where you can connect many accessories. MS906BT performs all the basic functions that an OBD2 scanner does including CEL, MIL, O2 sensor, etc. 8-inch screen for good data view. LED light to operate in the dark. Heavy at 23 pounds and might feel uncomfortable when using it while driving. MS906BT supports more than 80 US, Asian and European models. Connects wirelessly, supports Bluetooth transmission too. 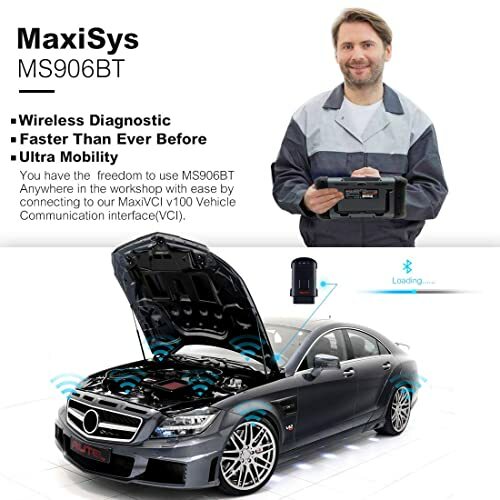 MS906BT is a professional diagnostic tool which is built for professionals who want to get a wireless scanner that is easy to use and can perform advanced functions, too. We have reached the end of this OBD2 scanner buying guide. Let’s now have a look at what to consider when buying an OBD scanner. Pick a scanner that is compatible with your vehicle (model, make, fuel type, etc., should be considered). Most scanners support cars but some may support light and heavy-duty trucks as well. Also, check for protocols. Most OBD2 scanners cover five OBD2 protocols but some may have support for additional protocols as well. Also, remember that OBD2 scanners only work with 1996 and beyond models. You will need an OBD1 scanner for older cars. Pick a scanner keeping your car and requirements in mind. If you are a DIYer and only want to save a little bit of money, you should go for a scanner that offers basic features. Conversely, if you a machinist or a professional, you should opt for a scanner with advanced features. This will help you save more money and give your vehicle a boost. Corded scanners have their benefits but Bluetooth scanners are preferred by more people these days. Bluetooth adapters work better with Android devices and WiFi adapters work better with iOS devices. However, some can support both devices. Moreover, many adapters also support Windows devices and Bluetooth-enabled laptops. WiFi adapters are typically more expensive than Bluetooth adapters, but the price usually depends on factors such as warranty, features etc. You should ideally pick one that is within your budget. Check out our guide on Best OBD1 Scanners in 2018 for some good OBD1 scanners under your budget. Note: Buying apps can add to the cost to try to get one that comes with a free app. Go for a scanner that comes with regular updates to cover more problems. Many scanners offer lifetime software support. This can be a good option especially because new vehicles come with new problems and only updates can keep you safe. Some scanners can update online and some need to be connected to a computer. While they both work fine, getting a computer can often be a problem for some users. Pick a scanner that comes with a warranty so that you do not have to worry about anything in case the scanner doesn’t work or support your vehicle. Most scanners come with 1-2 year warranty that is typically not extendable. OBD2 scanners work on apps. Some come with their own app and some supports third-party apps. You should ideally pick a scanner that has its own app but also supports for third-party apps so that you can decide if you wish to pay for an app or not. Plus, the features you get also depend on the app that you use, which is why third-party apps can be beneficial. This is it. We are done with our OBD2 and OBD1 scanner buying guide. To sum it up, OBD2 scanners should be your first choice (Bluetooth or WiFi) if you have a 1996+ car model. However, for old car owners, OBD1 scanners can do the job. Let’s get down to the basics, now you know how a normal automotive scan tool works, but now you need to know how to use it. Turn the ignition of your vehicle OFF, this is very important before connecting any equipment. Locate the 16-pin Data-Link Connector (DLC) port on your vehicle, normally tucked under and behind the steering wheel. 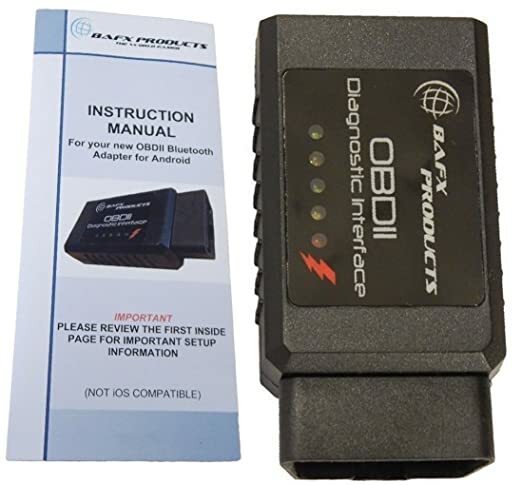 Plug in the OBD connector from your OBD2 scan tool into your vehicles port. Turn the ignition ON, note that the engine does not have to be running. Use the buttons on the OBD2 scan interface to scroll and select components from the Main Screen. Press the ENTER/EXIT button to select options from the menu, wait for vehicle information to load. View the summary of different systems from the Diagnostic Menu, such as MIL status, DTC counts, and Monitor status. Use the Scroll button to READ CODES from the Diagnostic Menu, these can be stored codes, pending codes or permanent codes. You will be able to read the codes and their definition on the screen. To ERASE CODES, use the scrolling feature and select ERASE codes, from there you will be prompted to confirm that you want to erase the code. Select Yes or Confirm that you want to Erase the Code from the vehicle information system. To view Live Data, use the scroll feature and the enter/exit button to select the Live Data function. Wait a moment while the OBD2 scan tool accesses the stream from your vehicle’s engine. If you wish to view a complete data set, select Complete Data Set and press Enter. To view Freeze Frame Data, select it from the Diagnostic Menu. Wait for the device to detect your vehicle information. Use the scroll feature to read the messages from the Freeze Frame data of your vehicle. To retrieve the I/M Readiness of your vehicle, select I/M Readiness from the Diagnostic Menu. If your device allows for viewing of two different cycles, you will have a choice between DTCs Cleared and This Drive Cycle. The display screen will show a list of codes to monitor many variables such as Engine Misfire (MIS), Fuel System Monitor (FUEL), O2S (Oxygen System Monitor) and more for both spark ignition and compression ignition engines. Press Enter/Exit to return to the Diagnostic Menu. To retrieve Vehicle information, select vehicle info from the Display Menu. An advisory message may appear to remind you to turn the engine OFF. Wait a moment and then review vehicle information on the screen. Here you will be able to read VIN number, ID number, Calibration Data and more. To Exit an OBD2 Test, select the Previous Menu button and press the Enter/Exit button. If a warning message appears, confirm that you want to Exit. What to do when your OBD2 scanner does not work? If you are having trouble using your obd2 scanner, I hope to help review some common troubleshooting problems and possible solutions. The first and most common problem may be an Error when linking to your vehicle. If the scan tool does not respond when you plug it into your vehicle, a communication error may have occurred. Double-check that the key in the ignition in your vehicle is turned to the ON position. Look at the OBD2 connector of your scan tool and make sure it is firmly connected in your vehicles DLC port. Verify that your vehicle is compatible with OBD2 technology. Turn your vehicle off, wait up to 10 seconds then turn it on and try again. Make sure the device you have purchased is not broken or tampered with. Maybe your vehicle is connecting to your device, but you are experiencing an Error during Operation. If this is your case, maybe your device is freezing or experiencing slow running and reading times. Turn off your ignition, wait for about ten seconds, and try again. On the other hand, you may have a more serious problem if your Scan Tool Doesn’t Turn On. Double-Check that the connector is secure in your vehicles DLC port. Look inside the DLC port in your vehicle, there may be some pins that are not straight or are missing. Check the vehicle battery and make sure it is charged with at least 8.0 volts.